As one of the biggest heritage brands to come from the country, Grenson has been spearheading British designed shoes for over 150 years. Read on for their complete history! Starting out as a child from a single parent family, Grenson founder William Green's success is nothing short of inspirational. Beginning as a runner boy, divvying out footwear materials and collecting the finished product, Green worked his way up to owning, and trademarking his own brand that we've all come to know today - Grenson. But where did it all start? The story of Grenson shoes is a tale of persistence and forward-thinking design that pulled one man from obscurity into becoming the owner of one of Britain's biggest footwear brands. Read on for the complete history of Grenson. When Grenson's founder, William Green, was a mere 4 years old when his father passed away leaving him and his mother to fend for themselves. In an attempt to keep their head above water, they moved from Bedford to Rushden in Northamptonshire with promises of cheaper rent and an abundance of work opportunities. Northamptonshire was the UK's shoe manufacturing capital at the time, and as soon as William came to an age where he could begin working to help support himself and his mother, he began working in the industry. William began making shoes in a loft above a Corn Merchants in Rushden. During these times most shoemaking was done in the home of the labourers, with each worker being provided with their daily materials and handing back in their finished wares when they'd completed. William started in the industry by handing out and collecting these materials. Realising there was more money to be made in the manufacturing, William's mother taught him how to produce men's boots alongside his side job with the shoe company. While it wasn't bringing in big bucks for the duo, the money they were making kept food on their plates and a roof over their head until William moved out at twenty-five. On finding his own place in 1860, he continued manufacturing shoes 'cottage industry' style until 1866 at the age of thirty-one. His business remained relatively unchanged for years until he met a shoe factor named Mr. Darnell. Darnell became very interested in William's shoes, complimenting them on their superior quality. He would travel up to Northampton every month on scouting trips for London shoe shops, picking up several pairs from William each time. After a longstanding arrangement, Mr. Darnell and his buyers encouraged Green to set up a more substantial factory space. By the time William had reached his 30s, his longstanding loyalty to the brand's he'd worked with paid off and he was named a 'factor'. Essentially, the job of a factor was a glorified, adult version of what he'd done growing up including; retrieving orders, sourcing materials and employing craftsmen to fulfill the orders. After the continued success of this business strategy, he began to formalise his workers and create a company under the name 'William Green & Son.'. Over time, his business got increasingly popular and expansion was the natural next step to take. They'd accumulated some of the best shoe craftsmen in the business but needed a new premises to base the company from. Daily production needed to increase and, luckily for William, production machinery had recently hit the commercial market. 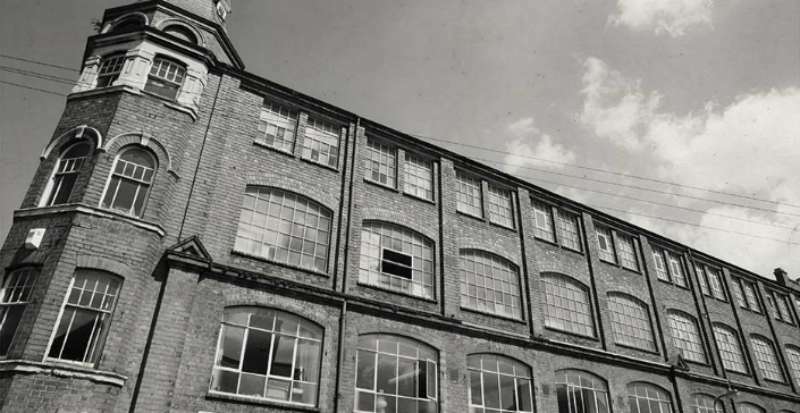 Buying a location in Green Yard, he set up a factory in 1875 and began using the Goodyear Welted method of shoemaking - one of the first factories in the world to do so. It was around this time that 'Green & Son' became the iconic name we know today - Grenson. In the years following, the business continued to see substantial growth and by 1895 its burgeoning size required the company to consider relocation again, a mere twenty years after their initial move. Setting up on the corner of Queen St and Cromwell Road, they built a new state-of-the-art factory to keep up with consumer demand. The superior production abilities of the premises partnered with the close proximity to the A6, the main road to London, saw them remain there for over 100 years until their move in 2013. Just seeing the company over the centurial hump, Grenson was hit hard as William passed away in 1901 to be succeeded by his son, CAK Green. Fortunately, he had created a resilient company with a solid management foundation that carried itself through the years following. Testament to this, as trade began to pick up speed their Queen St. factory premises was, once again, enlarged in the years immediately following Green's death. Around this time, the idea of global marketing and brand recognition really came into its own. Brands had started trademarking their names and investing in methods to increase awareness. Ever the pioneers, the registration of the Grenson brand name was filed in 1913 and, as it turns out, was the first brand name to be registered in the UK - highlighting Grenson's forward thinking nature. Along with the registration of the Grenson name, came mass distribution across retailers worldwide. As the global trade market began to light up in the early 20th century, Grenson started shipping their shoes across the world to Europe, the U.S and further afield. By this time, the company had developed its name as a global force in footwear to be respected alongside the best of them. As with all large national companies, as the World Wars came about Grenson were called upon to serve the boys in the trenches. 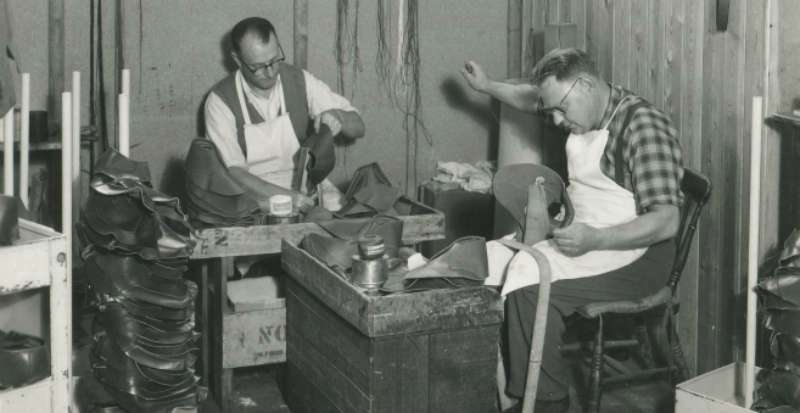 The insatiable demand for footwear among the soldiers saw the Grenson factory open nearly 24 hours a day with a staff of over 500 producing shoes on a daily basis. They were predominantly manufacturing thousands of purpose-built shoes and boots for the British and Allied forces which would withstand the tumultuous nature of war and the tough environment. One such development was a flying boot with a leg that zips off to make running a little more bearable if shot in enemy territory - how very practical! As wartime came to an end, the last surviving member of the Green family, Hayden, took a trip to the U.S and began to notice the different approach American men took to footwear. Notably, he admired the comfortable moccasins and decided to take the design home with him - integrating them into the Grenson line. Alongside this, after seeing some of the best hand stitching skill in the world on a trip to India he began to incorporate their unique techniques into Grenson's manufacturing process. As the swinging sixties came about, so too did the liberalisation of fashion. 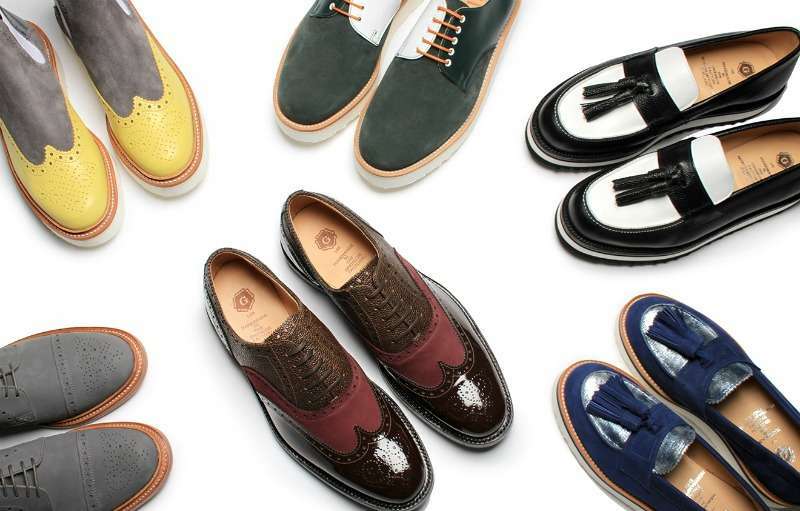 Grenson began to manufacture innovative, creative designs featuring alluring colours, exotic skins, and leathers. While these exciting developments kept Grenson relevant and desirable among fashion-forward consumers, the increase of cheap imports from eastern countries such as China and India saw substantial losses in sales as consumers opted for cheaper, low-quality alternatives. After a moderate performance over the previous fifty years, come 2005 Grenson decided it was time to reinvigorate and refresh the brand's image. Landed with the mammoth task, Tim Little joined as Creative Director with the brief of making customers understand the difference in quality between the real thing and imitations. Over the years, Grenson's competition had begun creating similar silhouettes and designs of their shoes - many younger customers simply hadn't experienced the real thing and Little was tasked with changing this. Grenson has historically put huge emphasis on the borderline obsession with attention to detail of manufacturing and high-quality English leather. So much so that certain styles require a mammoth 250 individual processes often taking four to six weeks to produce, however, the results speak for themselves with a lifelong pair of shoes. These processes have changed little since the inception of Grenson, only solidifying their predilection for quality over quantity. Eastern manufacturers had done an impressive job of replicating similar styles, but with rushed craftsmanship and a plethora of synthetic materials. Grenson began to take steps towards raising awareness among consumers in an attempt to win them back from its cheap imitations. This became to come to realisation when Grenson's stores began to pop up around London, but was really solidified when luxury global retailers Harrods, Selfridges and Liberty agreed to stock the brand. While their men's shoes are what really put the brand on the map, they revived their 'on again, off again' women's ranges in 2012 to great critical acclaim - proving that the brand's name can compete in the competitive women's footwear market. 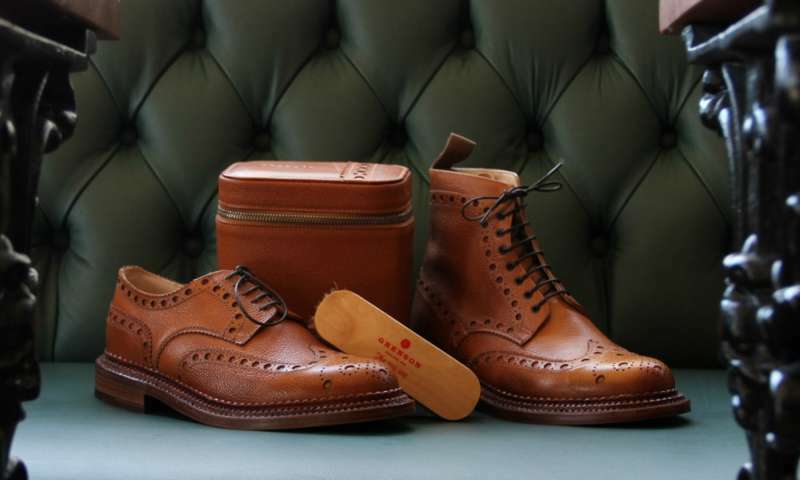 The success of these measures, among others saw the production line at Grenson struggle to keep up with demand - resulting in the need for another factory move. In the first move since the opening of it's Queen St. operations in 1895, Grenson relocated to a modern, clean and efficient premises in 2013. The new, contemporary feel of the factory signifies Grenson's place in the ever-changing footwear market, not to mention it's made production faster and versatile. 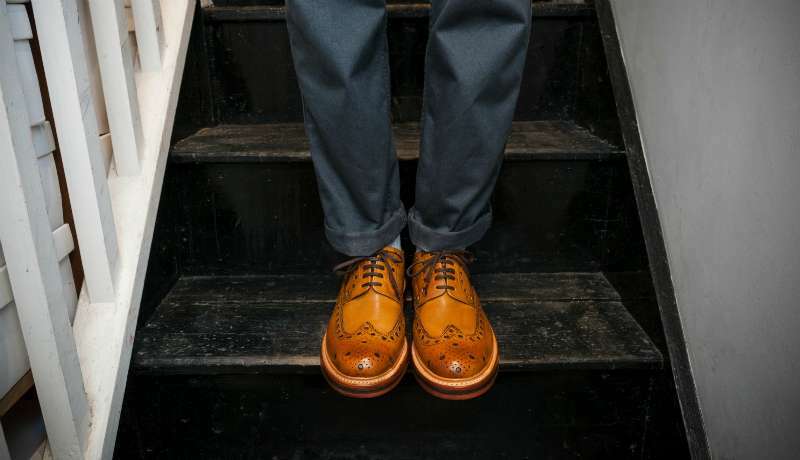 Programmes like the Grenson:LAB initiative started in the same year further showcase the brand's focus on forward thinking and knack for customer satisfaction. In 2016, Grenson celebrates their 150th anniversary with a completely new collection of shoes. The celebratory range will consist of a range of limited edition shoes as well as bringing their heritage roots to the forefront by reproducing classic silhouettes from the Grenson archive. The anniversary has also served as a time of evaluation for the brand, using it as an opportunity to strategically look forward and assess the direction of Grenson. Alongside a plethora of new products constantly being developed including bags, leather goods, and socks. Grenson has expanded their retail presence by taking the brand stateside with a New York City store opening in January 2016. These days Grenson continues to keep one foot firmly in its heritage roots, while always looking forward to the customer of tomorrow. Measures such as their apprenticeship scheme keeps a young, creative and innovative spirit in the factory - ensuring Grenson always stay at the top of their game. After the continued success of being a small time 'cottage industry' shoe manufacturer, by 1866 William Green began to formalise his workers and create a company under the name 'William Green & Son.'. As his products gained popularity, Green bought a location in Green Yard to set up a factory in 1875 and began using the Goodyear Welted method of shoemaking. Grenson were pioneers, being one of the first factories in the world to use this method. It was around 1875 that 'Green & Son' became the iconic name we know today - Grenson. By 1895, Grenson's burgeoning size required the company to consider relocation again, a mere twenty years after their initial move. Setting up on the corner of Queen St and Cromwell Road, they built a new state-of-the-art factory to keep up with consumer demand. As with all large national companies, as the World Wars came about Grenson were called upon to serve the boys in the trenches. 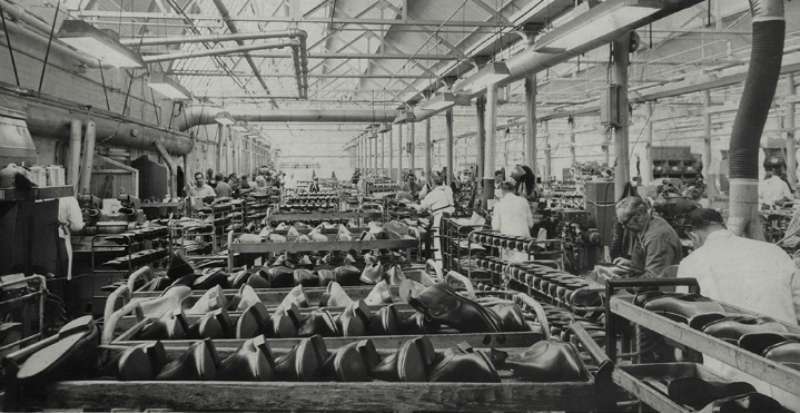 The insatiable demand for footwear among the soldiers saw the Grenson factory open nearly 24 hours a day with a staff of over 500 producing shoes on a daily basis. In the first move since the opening of it's Queen St. operations in 1895, Grenson relocated to a modern, clean and efficient premises in 2013. That's your lot! The continued success and forward thinking nature of Grenson really stand as testament to its company policy of always looking forward. It's no secret that certain pivotal points in the brand's history have set them apart from the crowd; whether that's the early trademarking of their name or the pioneering use of the Goodyear welted method of shoemaking in their early days - Grenson has always looked ahead for inspiration. Since their revival in the early 2000s, they've gone from strength to strength under the leadership of Creative Director, Tim Little. His clever repositioning of the brand as a high-end provider of quality footwear stocked in the likes of Harrods, Selfridges and Liberty has, once again, put Grenson firmly in the mind of those seeking a lifetime investment. Feel like grabbing yourself a sturdy pair of Grensons? Follow the link below to their brand page!